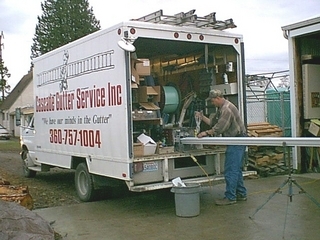 End routine gutter cleaning, lowering maintenance costs and hassles. Mounts securely in the downspout for the gutter system. clogging underground drainage systems. Drain Guards can be installed at any level into any downspout. Preventing unwanted debris from entering the system and causing expensive clean-out procedures. Installs into any standard gutter system. Are all gutter companies the same? being used from one company to the next. But there is a difference with the quality of sealant on seams, the appropriate length & number of screws & hangers used, as well as proper placement of downspouts and slope of gutter runs. THE BIG DIFFERENCE IS IN THE INSTALLATION. Our installers are long employed, highly trained and courteous. Our crews have the expertise to hand tie miters for a clean, aesthetically pleasing corner that will not leak today or tomorrow. Our gutters are installed so there are no seams or joints except at corners and where downspouts attach. We use the highest quality sealant available, so all joints are made watertight. What is involved in the process of gutter cleaning? First and foremost, the number one concern is always safety. Be sure your ladder is properly positioned and you are using it correctly. Always wear gloves to remove debris from your gutters. If your drainage system involves underground pipe, leading to a drain field, disconnect the downspout from the ground riser. This will prevent any debris from plugging up your underground system when you spray out your gutters with water. Depending upon your environment (more trees more cleaning), you may need to clean your gutters more or less often. It is best to check them after the fall leaves have dropped and in the spring. What new technology is available to make it easier? New technology is developing everyday to make your gutter systems easier to keep clean. There are several different types of screens that can be attached to prevent larger particles from collecting in the gutter. In aid of cleaning, you may find various tools at your local hardware store to help you clean out gutters from ground level with the aid of water. What is the biggest mistake people make when cleaning their own gutters? Washing down all the debris into their underground drainage systems, thus plugging them up. Remember to always remove, by hand, the major amount of debris that has collected into the gutter system. There always comes a time when the old gutters need to be replaced. However, many things can be done to give new life to your old gutters. When mitered corners or end caps begin to leak, you can often solve the problem by cleaning the old sealant away and replacing with a new sealant. How effective are nets and filtering devices installed in gutters? A "gutter guard" can be helpful in the prevention of clogged downspouts depending on the amount and type of trees (conifer needles or deciduous leaves) that may fall onto the roof and end up in the gutters. Downspout outlets in the gutter system can also be protected by a mushroom screen, but keep in mind that once in place it is mandatory to clean the areas where build-up will occur. It costs a great deal less to protect against water damage and moisture penetration than it does to correct unsafe, unhealthy conditions and structural damage. * The type and color of gutter material used - aluminum, steel or copper. * The lineal footage of gutter required. * The amount and length of downspouts. * Number of mitered corners. * Degree of difficulty is factored in. * Pitch and material type of your roof. Do you have any other tips for someone cleaning their own systems? Trim back tree brances that scrape against or overhang the gutters. Remember, moisture, directly or indirectly, causes more problems in buildings than any other single element. Almost every moisture problem can be either decreased or eliminated by reducing the moisture level in the home or building. Rainwater harvesting (also called Roof-water harvesting) is the accumulating and storing of rainwater for reuse before it reaches the aquifer. It involves collecting the gutter system's rainwater run-off from your rooftop into a Rain Barrel in order to store it for later use -- inside or outside the home. Rainwater collected from the roof-tops can make an important contribution to the availability of drinking water, especially here in the Pacific Northwest where ground water is the primary source of water on many of our islands. With island population growing low aquifer levels create a potential for seawater intrusion. If you're looking for ways to $ave on your water bills and ensure that your lawn and plants don't suffer in the drought, the old-fashioned technology of rainwater harvesting not only $aves you money, but keeps your lawn green and your plants healthy & happy with clean, oxygenated, chemically untreated water. Puget Sound averages about 3-feet of rain per year, most of it falling between November - March. Having the downspout of your gutter system go into a Rain Barrel offers an easy option for rainwater harvesting. if you have a lot of plants to care for, consider linking several together to increase your storage capacity.